The market doesn’t go up like a tower. Neither it falls like a stone. If the direction is supported by fundamentals (Like, if it has posted better/worse than expected results), the process of going up/down sustains for a slightly longer term. 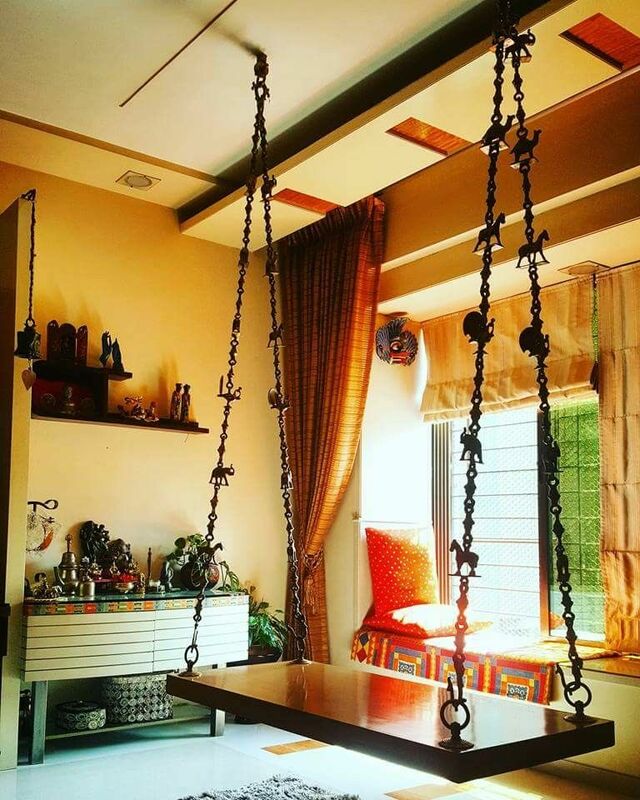 But, in short, it swings! Swing traders use technical analysis to look for price momentum. There are always three outcomes in a said timeframe. Or, it neither goes up/down reasonably enough to take a decision. To gauge which one, ‘Swing Low’ and ‘Swing High’ are one of the most widely used terms among traders. It is used to identify trend directions and trend reversals. 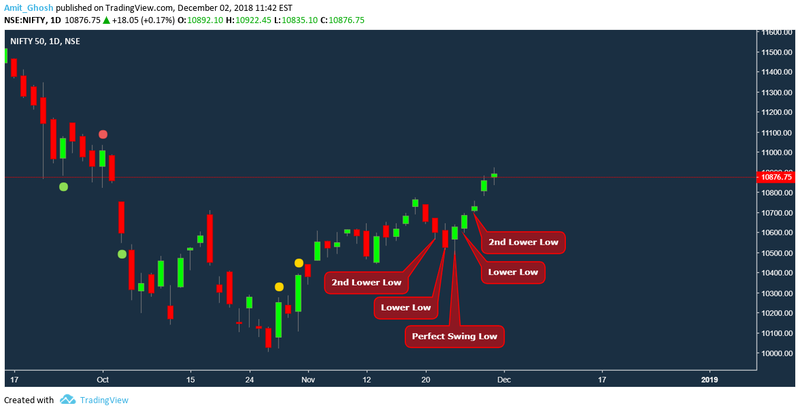 A swing low is the low of the candle in a candlestick chart or bar chart or hollow candle chart that has a higher low on either side. 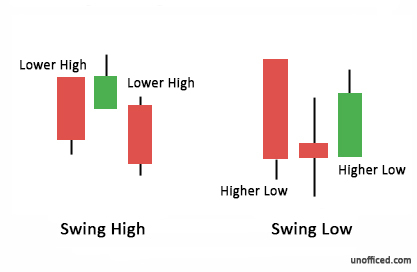 A swing high is the one that has a lower high on either side. 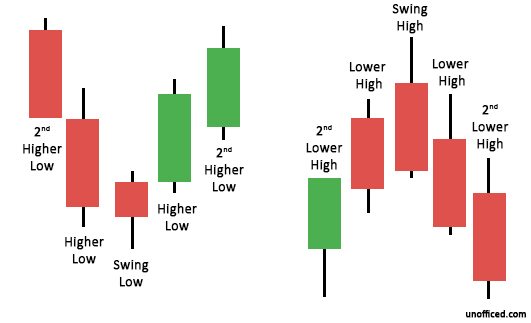 In the case of Swing High, the high of the neighbour candles are lower than the high of the main candle itself. In the case of Swing Low, the low of the neighbour candles are higher than the low of the main candle itself. 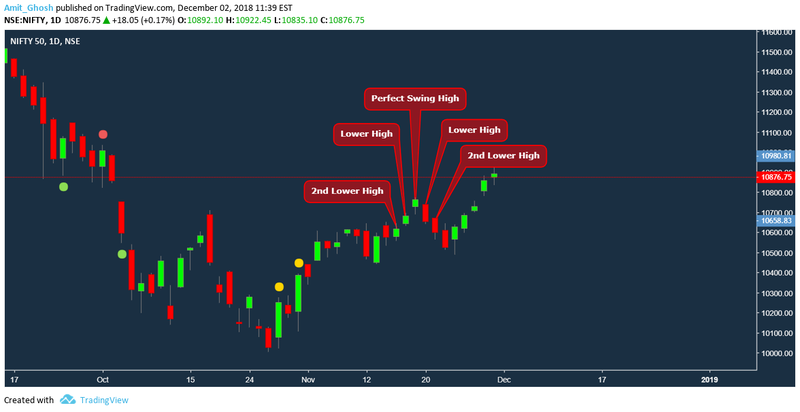 If someone is aiming to find swing high and swing low in the lower timeframe of a highly volatile stock, there may be too many swing highs and lows creating noise due to the volatility. Even in larger time frames, the noise is significant. To reduce this noise, we define a 2nd higher low or 2nd lower high and confirm that candle as a Perfect Swing Low or Perfect Swing High. But there is a cost if you wait for the proper formation of perfect Swing Highs in some scrip. The scrip already moves a significant amount missing us a good amount of profit. Also, it dramatically affects the risk: reward system. Our stop loss (risk) becomes far and our take profit (reward) becomes near. So, it is quite reasonable if we approach the Swing Low and Swing High as it is from its classic definition rather than aiming the perfection. It shows two perfect Swing Lows have been formed after a perfect Swing High. People has wrong perception that Swing High and Swing Low forms alternatively which is wrong. 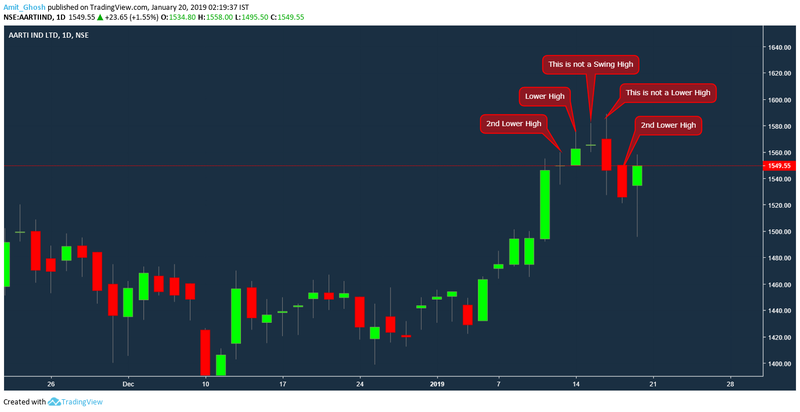 This is an example of Aarti Industry where although it looks like a Perfect Swing high, it is not even a Swing high at all! So, after a Perfect Swing High and two Swing Lows, it tried something like another Perfect Swing High but failed miserably. But it definitely counts as a Swing High. But Aarti Industry doesn’t count as Swing High as well because there is no first Lower High in both sides. *Note, Perfect Swing Highs and Perfect Swing Lows are also called Gann Swings.